Single bills laser etched with corporate logos, powdered pigment is used to match the color as close as possible. 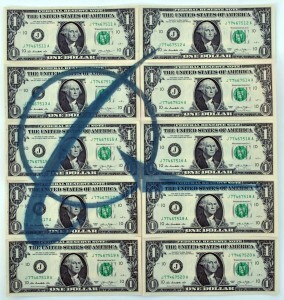 The bills are sealed and sent back into circulation creating a singular visual moment. 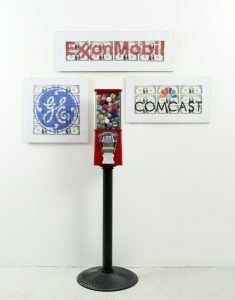 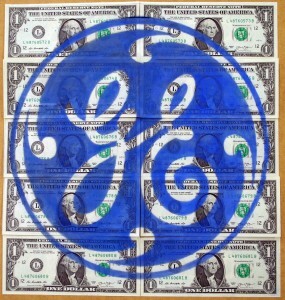 “Here Today-Gone Tomorrow” addresses concerns over the expanding influence of corporate interests on government policy. Rebranding our money to fit our current social and political atmosphere. 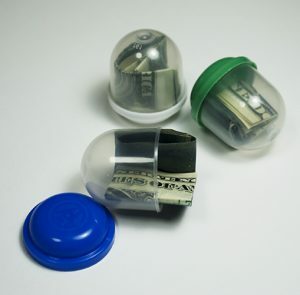 During exhibition mixed sets of bills are available for purchase through gumball machines for $.50.